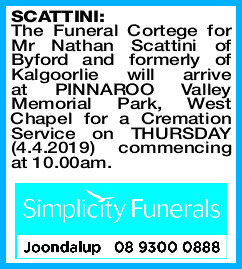 The Funeral Cortege for Mr Nathan Scattini of Byford and formerly of Kalgoorlie will arrive at PINNAROO Valley Memorial Park, West Chapel for a Cremation Service on THURSDAY (4.4.2019) commencing at 10.00am. 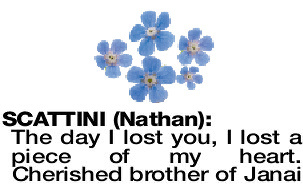 Much loved eldest son of Noel, stepson of Martine. 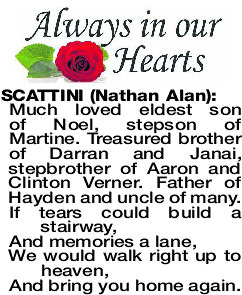 Treasured brother of Darran and Janai, stepbrother of Aaron and Clinton Verner. Father of Hayden and uncle of many. Beloved son of Kerry, step-son of Mike and brother of Darran. 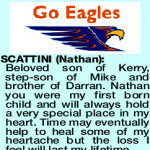 Nathan you were my first born child and will always hold a very special place in my heart. Time may eventually help to heal some of my heartache but the loss I feel will last my lifetime. Brother, we are heartbroken beyond belief. Growing up you were my protector, my best mate, my world. 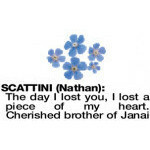 You were the most caring, loyal brother anyone could ask for. Life will never be the same without you. I wish we could play cricket again in mum's backyard - fighting over the rules, the conditions, the lighting...everything really. I will never forget you and will cherish the memories that we had together. 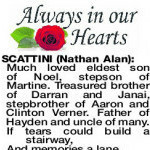 Your passing has left a hole in my heart and my life that can never be filled.